Last time, I spotlighted an example of the spaghetti western. This week, I want to show that other famous genre of Italian movie: the giallo. ‘Giallo’ just means ‘yellow’ in Italian, but the term is also used for crime mystery pulp fiction after a famous series of such books named ‘i libri gialli‘, i.e. ‘the yellow books’. From there, it was a logical step to also apply the name to movies with similar themes. One of the most famous directors in the genre is Lucio Fulci and one of his more popular movies is Lo squartatore di New York or The New York ripper if you prefer Shakespeare to Dante. A murderer with the voice of a duck1 is stalking the streets of New York. Lieutenant Williams, played by a very Jeremy Clarkson-looking Jack Hedley, leads the investigation. He quickly realises he’s in a police thriller and that he therefore has to enlist the help of a psychiatrist to catch his man. He finds Dr. Davis (Paolo Malco) alone in an otherwise empty auditorium playing against his chess computer, because that’s what you do if you’re a doctor. Davis: Don’t tell me you’re thinking of beating me. Well, probably not, because machines don’t tend to think anything. Also, this engine is notoriously weak. But all that is immaterial. The real question here is how black managed to swap his king and queen. It is easy to come up with a more or less reasonable series of moves leading to the above position (1. g3 e5 2. Bg2 d5 3. d3 Nf6 4. Na3 Bg4 5. h3 Bf5 6. Nf3 Be7 7. 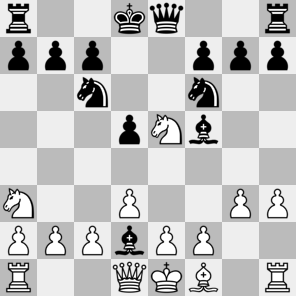 Nxe5 Bb4+ 8.Bd2 Bxd2+ for example), except that black’s king and queen would still be on their original squares. So what happened? How did the black royalty change places? One could think maybe someone just set up the pieces wrongly but the computer takes on e5, so it must know there’s a queen on e8, not a king. And it could not know that if it had not moved its queen there. But if it did that, and no computer ever would, white must have wasted at least three moves – about as many as the ripper has wasted women. Realism: 1/5 This is another one of those positions that look quite plausible. Even white’s blunder is understandable: he thought black had put a bishop in his own way and overlooked the riposte Bb4+. But the fact that the black royalty is playing switcheroo drives the realism score way down. Probable winner: Normally, I’d say black is winning as he’s a knight up, but chess challenger 8 is really weak, so maybe white still has a chance.